What do you call a person who has shamefully neglected her writing for weeks and weeks? You call her a lazy bum! You know, it’s an act of utter indelicacy to call someone you barely even know a lazy bum. What if I have been busy and unavailable? Yes, it’s true. I was away, visiting India, too busy checking things off my list. I was at the helm of affairs, meeting good natured uncles and aunts most of whom saw our baby for the first time. For those of you out there who are mothers, does it ever bother you when your husband’s side of the family see an uncanny likeness of your baby’s best features with those of your husband’s? And then there was this tussle for power between my people and his, contemptuously trying to brand our little boy’s nose(which some say isn’t his best feature) on either side of the family! God! I really really miss being a part of that madness. There is nothing more pleasing than meeting your husband’s dancing eyes across the hall when an aunt laments on how our baby boy hasn’t got his father’s aquiline nose! We are back home now, after a sumptuous holiday, after a formidable never ending flight with our little tyrant, back home to a beautiful onset of fall. Slightly colder and windier than when we left, the leaves have dreamily begun to change color. 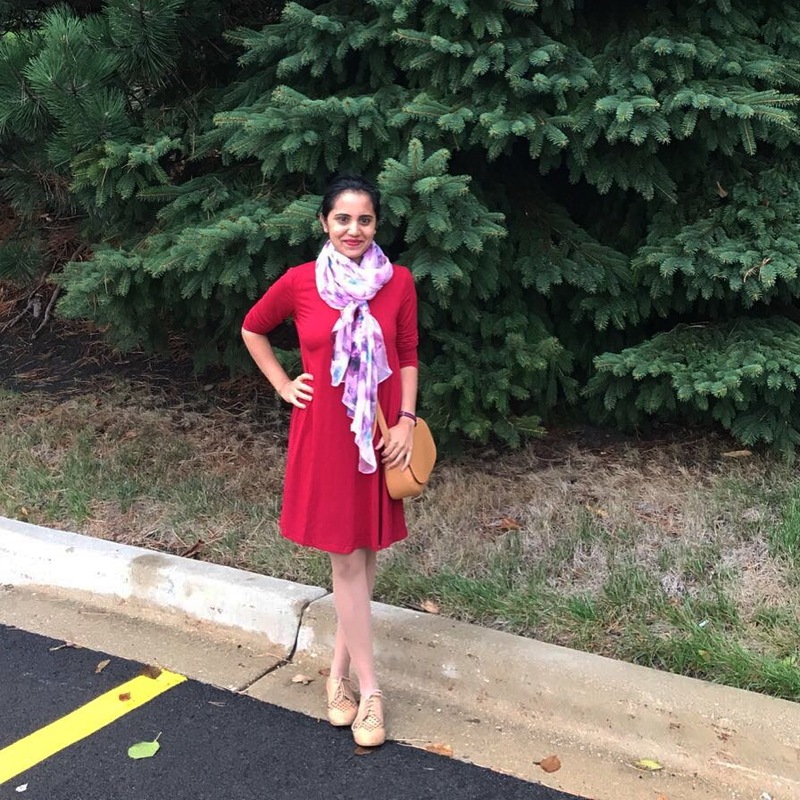 After a week-long struggle of trying to get back to the normal grind(the struggle including dinners at 2am and play time at 3), we got out today and I am glad I picked up this dress last month in burgundy, which blends beautifully with the weather outside. I never let go of an opportunity to wear a scarf, I have a thing for them and I dare say you will see a lot of scarves in my future posts. 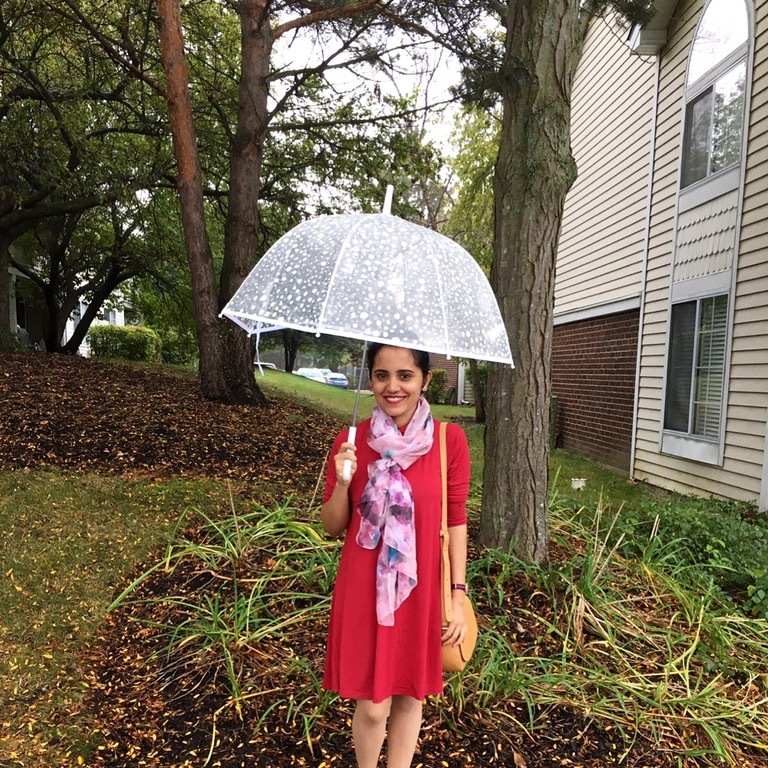 I also got to use my new umbrella today as it was drizzly. The scarf is from Charming Charlie. Let me know what you think of the look and have a beautiful dreamy week ahead you all! !